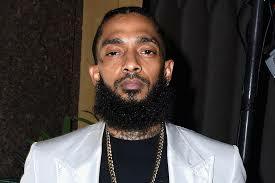 The Grammy-nominated rapper Nipsey Hussle was killed in a shooting outside his clothing store in Los Angeles on Sunday afternoon, law enforcement sources said. Two other men were shot, and a suspect remained at large. Police sources said Hussle was shot multiple times in the parking lot at Marathon Clothing on West Slauson Avenue in South Los Angeles at about 3:25 p.m. and that he was pronounced dead at a hospital. One of the other men was being treated at a hospital, and the third man declined treatment, Los Angeles police Lt. Chris Martinez said. A large crowd of people, many of them crying, gathered at the scene on Sunday as police and media helicopters whirred overhead.